Voile (pronounced v’wall or sometimes voy’l) is an extremely lightweight, semi-sheer fabric. Polyester voile is often used for curtains or curtain linings, but cotton voile can be used for garments, especially summer dresses. It’s also ideal for historic chemises or shifts. And, because of its weight, it’s great for doll clothes and baby clothes. It can even be used for linings, if you don’t need something slippery. Cotton voile is very easy to sew with. It lends itself well to all manner of embellishment, including pintucks, gathering, pleats, ruching, and so forth. Use a small sewing machine needle (#9) and either cotton or polyester thread. Flimsy fabrics tend to be swallowed by the feed dogs, so don’t start sewing at the very beginning of the seam, but begin about an eighth of an inch from the edge. You might find it helpful to stabilize the fabric with a spray starch alternative or tear-away stabilizer sheets. Backstitching will add a lot of bulk, so try the couture method of reducing your stitch length for the first and last 1/2″ of the seam. If you want to be sure the stitching will hold, pull the thread tails to one side of the fabric and knot them before trimming the threads. For pressing, use medium-low or low heat and a pressing cloth. Voile is perfect for doll clothes, so I have several different colors in my stash. 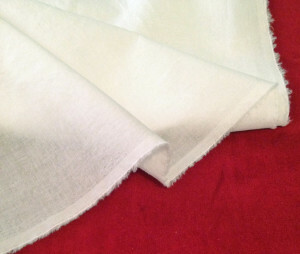 My favorite is a high-quality white voile. It has a wonderful hand, very soft, with both fluidity and volume. It’s perfect for miniature Victorian undergarments, but I’ve also used it to make a dress shirt for a 17″ male fashion doll, and a Renaissance-style shift for a 16″ Tyler Wentworth doll. Unfortunately, cotton voile is one of those fabrics that’s nearly impossible to find for a reasonable price. My local fabric shop doesn’t carry it, and even places like eBay and Etsy don’t usually have it, unless it’s imported (and therefore quite expensive)! I usually order my voile from Fabric.com, but their supply tends to be hit-and-miss. If you do order some online, make sure it’s cotton voile and not polyester! This entry was posted in Saturday's Stash and tagged Dolls, Edwardian, Fabric, Lingerie, Saturday. Bookmark the permalink. Glad you found my post useful! If you can’t find cotton voile locally, try online. I get mine at Fabric.com, but a few other online fabric shops carry it, too.